With their combination of power and luxury, there’s a lot to love about BMW’s. Unfortunately, even the best cars can suffer ugly dings and dents, and there’s not much you can do to stop it. When this happens, Paintless Dent Repair (PDR) can help your vehicle look new again. Paintless Dent Repair is a special repair process where dents are fixed from behind. With this, the tools can avoid touching your factory paint job, allowing the repaired part to look as close to new as possible. 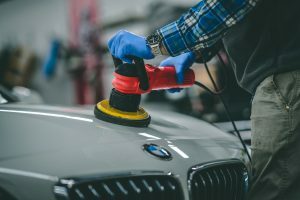 There are no chemicals or bonding agents necessary – just the same tools that many dealerships use to fix their vehicles if they’re dented before sale. PDR costs less than a trip to the body shop. Make no mistake – if your vehicle has severe damage to it, body shops are still the best place to go. Dents and dings don’t require the time or expense of a full-service repair shop, though, and we’re able to pass the savings on to you. How Fast Can You Fix My BMW? Here at EZ Dent, serving Athens, Atlanta and all of North Georgia, we’re proud of the speed of our service. In fact, most dent repair jobs can be done in one hour or less. Our shop focuses exclusively on dent repair – so our staff can make a solid, efficient appointment to match your schedule. *Disclaimer – EZ Dent is not affiliated with BMW or authorized BMW dealerships. For more information, or to schedule an appointment and get your BMW fixed, contact EZ Dent today.